We all know that beans are a musical fruit, or good for your heart, depending on which version of the rhyme you learned when you were a nipper, but in the UK at least no vegetable garden or allotment plot is complete without a wigwam foaming with scarlet-flowered runner beans. The reason? Well, not only do they make a delectable vegetable, they are drop-dead gorgeous too. 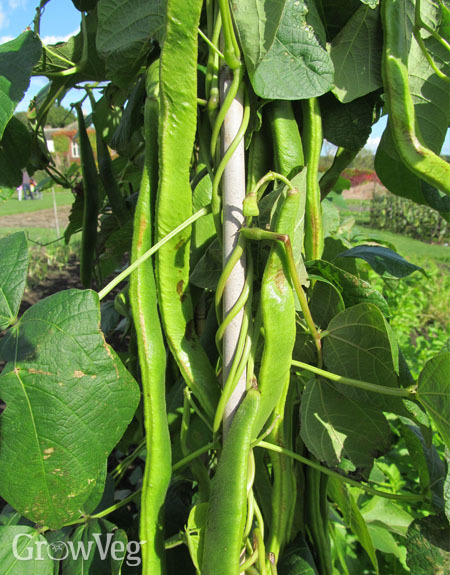 Runner beans were traditionally planted atop filled-in trenches dug the previous autumn and stocked with well-rotted manure or shredded newspaper. Kitchen waste will work too, because the main reason for doing this is to provide a deep, moist root run that will help runner beans to resist drought. Drought is a major enemy of beans, so avoid this at all costs. Start sowing runner beans in spring and keep sowing every couple of weeks until early summer to spread out the harvest. Exactly when to sow will depend on your climate, so check out our Garden Planner for customised advice. The earliest seeds can be sown in modules or seed trays in a greenhouse, tunnel or on a sunny windowsill for transplanting later on. Runner beans dislike cold soil, so wait until the soil has warmed to at least 10ºC (50ºF) before planting them out. You can warm soil a week or so in advance of sowing or planting using cold frames, cloches, horticultural fleece, or even just sheets of plastic. Later sowings can be made directly where they are to grow, but beware of hungry slugs and make sure to protect seedlings from wind damage. Covering them with a cloche (even a recycled plastic bottle will do) will provide all the shelter they need until they establish. In cool or windy locations you can protect plants and boost pod production by growing them to maturity in a greenhouse or tunnel – just make sure to ‘stop’ the plants, or pinch out the growing tips, when they near the roof. While closely-related French beans are self-pollinating, runners need help from pollinators such as bees, so yields will be hampered by a wet, cold summer when insects are unlikely to be flying. A dry summer is bad news too, so make sure to water during rainless spells and mulch to preserve that moisture. Beans are usually pretty trouble-free, but keep an eye out for black bean aphids infesting the growing tips. If this happens, clip off the tips and dispose of them. Get supports in place before planting your runners. Any frames or trellis need to be sturdy enough to support these lanky beans, which grow to well in excess of 2m (6.5 feet) tall and which will become extremely heavy when laden with pods. Netting is often used along with canes or poles to allow the vines to clamber about freely. Bean wigwams look just as attractive in the flower garden as they do in the vegetable garden. 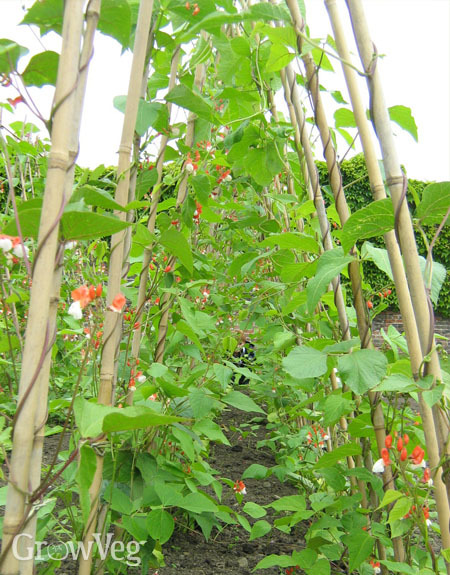 Runner beans were originally grown purely as ornamental plants, so you can find exciting flower colour choices such as ‘Scarlet Runner’ or the ravishing red-lipped white flowers of ‘Painted Lady’. You may need to tie young plants in to their supports initially, but once they’ve got a grip they should manage on their own. If they’re catching the wind they may need to be tied in at intervals. When the plants reach the top of their supports, pinch out their growing tips to help divert energy into flower and pod production – and to avoid the plants turning into a jungle of tangled stems and foliage. Such tall, leafy plants will cast shade, so plan your garden to include shade-loving crops behind your towering beanstalks. Keeping up with weeding, watering and mulching is important while the beans are growing. Apply an occasional liquid feed too. Harvesting will commence around midsummer and continue until the first frosts. Runner beans will crop slightly later than French beans, so for variety and to extend the season it can be worth growing both. Pick your beans while they’re still quite small to avoid any stringiness, though having said that modern cultivars are usually bred to be stringless. Pick at least every other day, because you’ll be astounded at how rapidly a bean pod can grow – they seem to go from flat to fat in the blink of an eye! If you’re going to be away during the summer, invite friends and neighbours to help themselves to your beans to encourage continued cropping for when you return. Alternatively you could use the break as an opportunity to switch from producing fresh pods to maturing beans for drying. Gluts of the whole fresh pods can be chopped, blanched if you wish (I never do, I can’t tell the difference!) then frozen. Beautiful, productive, and delicious – what more could a vegetable gardener ask for? Share your runner bean growing tips or favourite varieties with us in the comments section below. "Can Runner beans be grown in containers? If so, how deep do they need to be. Id like to grow an edible privacy screen on my deck and thought these would be perfect "
"Hi Paula, I'd go for a container about 12 inches (30cm) deep to give your runners' roots plenty of room, and make sure to keep the soil moist." "Great article-got a quick question...something keeps eating the flowers off my beans...?birds? I don't use chemicals, and can't see aphids on them, (probably down to the loads of birds my garden is home to). D'you think strips of flapping plastic might work? Sue." "Hi Sue. Birds such as sparrows will sometimes peck the flowers off runner beans. You could try using strips of flapping plastic to frighten them off, or alternatively net your beans to keep them off altogether. We've got an article on keeping birds away from your crops that you might find interesting - type 'Bird Control in the Garden' in the search box at the top of the page." "Why are my runner shrivling they are young beans about 3"long." "The containers I asked about earlier,did work well thanky out to Ann Marie Hendry for advice. However, White fly infested my runner beans. I didn't catch them in time and they completely decimated the vines. Garden centre thinks they possibly came off neighbours tropical outdoor plants. Can I reuse soil? How can I prevent future infestations that won't hurt beneficial insects? " "Hi Chrissy. I'd say there are two main contenders for why your little runners are shrivelling up: dry soil, or poor pollination. Runner beans do enjoy quite a lot of water, so if it's been dry where you are, this is a good bet. You may need to water heavily every day if dry weather persists. Paula, whitefly don't live out any of their life cycle in the soil, so the soil in your pots can be reused. It would be worth adding a few handfuls of fresh compost, potting soil or slow-release fertiliser to replenish it when you add the next crop. Growing flowers in pots near your vegetables will help to attract pest predators as well as pollinators, and they will help to control whitefly and other pests." "This is a beginner's question too simple for the answer to appear in guides! HOW do I harvest runner beans? 1) Cut with secateurs or similar 2) Pull off at top of bean leaving stalk attached to plant 3) Pull off whole of stalk with bean, back to where it attaches to stem And whilst I am asking; having overbought at the adjacent church's plant sale I had to put 4 Runner beans and two tomatoes into a 20"x15"x10"High container. (Recycling bin from the last but 2 council scheme). All growing well. Beans 8ft high and lots of flowering; toms 4ft high and plenty little fruits appearing. But the tomato leafs are going brown. From googling I think either Early Blight or Magnesium deficiency. I have been keeping well watered but only fed a couple of times. And again today. Any tips? " "Hi Steve. Beans have to be harvested quite carefully because it's easy to accidentally yank the stem and break it (been there, done that!). You can snip the thin stalk that attaches the bean to the main stem with secateurs, but with practice you'll find that you can nip it off with your thumb and forefinger just above the top of the bean. It's a good idea to use two hands for this, especially at first - one to pluck, and the other to hold the stalk so it doesn't pull on the plant. If you're in the UK it's unlikely that your tomatoes are affected by early blight (though late blight is common here), but if the leaves are yellowing it could be a magnesium deficiency. We have an article called Troubleshooting Tomato Problems, which covers magnesium deficiency - use the search box at the top of this page to find it. I hope that helps!" "Hi from Canada. Still growing beans from my Mum 's garden in England over twenty years ago. I think I read somewhere that all raw beans, pinto, kidney etc. are deadly poison so must be cooked.. is this true of scarlet runners? Thanks"
"Well you seem to have survived the last twenty years so it's a bit late to worry? NHS says only Kidney and Soya need special cooking Oddly I yesterday planted this year's beans, but you have reminded me I kept a few from last year as seed. Must try them!" "woah, not the answer I expected, lol nope, NEVER eaten a raw... raw... bean and ate Mums runners all summer when I lived in England as a child Am now 74 so you can say I am full of beans I too planted ours yesterday from dried beans from last year and the year before Sadly our boiling or cold summers up northern Ontario dont do them justice so I now grow them for the flowers...and to remember my Mum "
"...just checked, yes eating the whole raw beans CAN make you sick if you eat a lot... dried Lima beans and dried Kidney beans contain poison and must be cooked Dont shoot the messenger ????" "But not beans in general. After all you can eat many beans eg mung beans and chick peas just sprouted so totally raw!" "That's so true Steve P... I ought to have been more clear in my original post asking about Scarlet Runners in particular (the INSIDE bean, but then discovered eating the whole thing in large quantities can make someone ill) :-( Also when I checked I got confused, as would anyone maybe, when they are speaking about the actual "bean" - eg the mostly green long pod; vs the inside "bean" or seed. Who knew things could get so complicated :-) Good luck growing everyone, have a nice Summer! " "sorry about multiple posts, couldnt tell if code was in caps or not and kept pressing....:-("
"Often security letters are not case sensitive. If you read this they are not as I will deliberately do them wrong! It says "3L7AV" i will put "3l7av""
"Hi never grown my own veg before so thought I would start with toms and runners, can I grow runners as hanging plants instead of in the ground up canes as I have limited space thanks janet "
"Hi Janet. Runner beans are very thirsty plants as well as being very tall, so are not ideally suited to growing in hanging baskets. You may be able to make it work if you can find a dwarf variety. Let us know if you try this and if you have success with it!" "Janet I doubt if you can get them to grow DOWN as they have a natural urge to twine round something and grow UP. Though when we left several plants together in a pot on the ground with nothing to climb they wrapped their tendrils together and pushed sideways, so why not give it a go. They will probably be OK with horizontal canes." "Two years running now, my runner beans do flower, but when the little pods are abour 2 cm / one inch long, the tiny pods shrivel and die. Any solutions? This is in Yorkshire UK"
"Denise - hopefully there are wiser people than me to answer - I found possibilities here harvesttotable.com/bean_growing_problems_troubles/ Janet - did you try it? I have one that got to the top of an 8ft cane so I am training it along a telephone wire that runs horizontally. Seems happy!" "Hi Denise. The first thing I'd check is that the beans are being properly pollinated. Planting plenty of flowers near where your runner beans grow and avoiding this use of pesticides should help. Too much heat and not enough moisture could also be the culprit - not normally a problem in the UK, but this year it's definitely an issue! Beans need quite a lot of water. A good deep soaking every few days in dry weather is better than a light sprinkle more often. Beans also need rich soil. Raking or watering in a balanced organic fertiliser could help this year (avoid any that go heavy on the nitrogen). Perhaps try the compost trench idea in the article above next year, and make sure to dig in or mulch with plenty of well-rotted compost or manure from a trusted source. " "I would love advice please as to why my runner beans will not flower! They are strong healthy plants growing up a teepee. My first efforts didn't flower but that was my fault as I added nitrogen, not realising that I shouldn't do that but this time they are in the open, not in a sheltered green house, warm sun, enough water and insects buzzing around, nothing nasty going on, no bird interference but now the plants are over 5feet tall and still no flowers. I don't know what I am doing wrong. I would really appreciate some advice please. Wendy "
"Hi Wendy. Depending on when you sowed your beans and where you are located (I'm guessing somewhere in the Southern Hemisphere if you're growing beans in November! ), you may just need to be patient a little while longer. 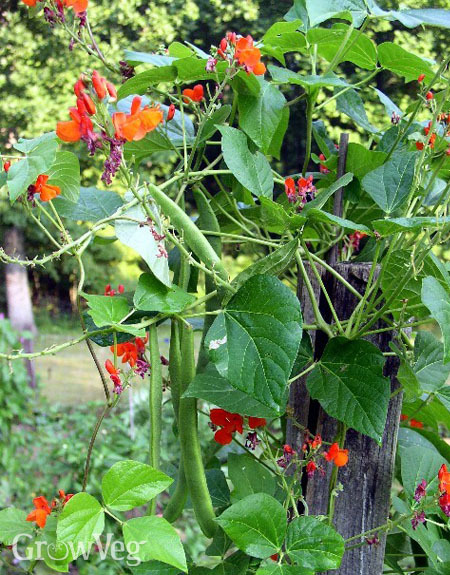 Runner beans can grow to well over six feet tall before they begin flowering. They do need plenty of water, so make sure they don't dry out and mulch with well-rotted organic matter such as compost to help improve the soil and feed the plants." "Thank you Anne Marie. Yes I am south of the equator - in Kenya - and the plants have been growing for more than a couple of months now. I will be patient and give them more time. I will give them some more compost and manure and will keep my fingers crossed that they flower in the next month or so. Thanks again. "